Initially, I wanted just one dashboard. I much prefer to have all the information available on different tabs of the same report rather than having to open (and maintain) multiple PowerBI dashboards. However, disk utilisation data is tied to a different snapshot_id (2), is point-in-time, collected at a different interval and kept for a longer time. 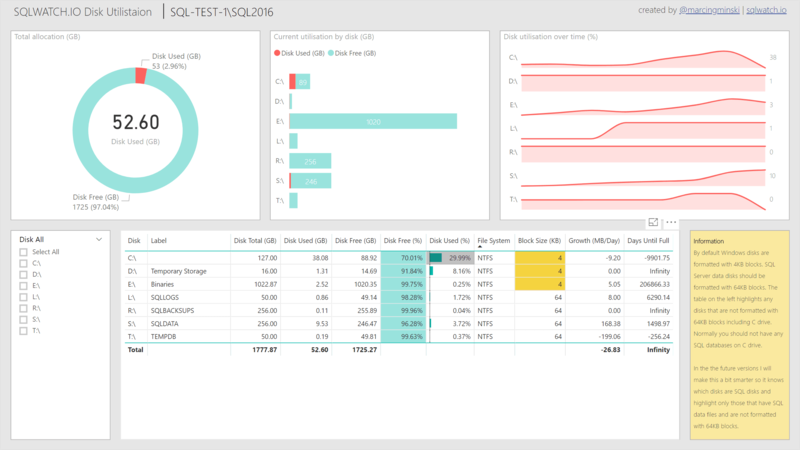 PowerBI always downloads all data sets when refreshed which would mean that if we only wanted to see last 60 minutes of SQL Performance Activity, PowerBI would also (very kindly) download storage data which would impact the performance of the SQL Server and the PowerBI dashboard. This could be addressed if PowerBI handled composite primary keys without workarounds. It can only use single columns to build relationships between tables which would cause duplicate values in the snapshot_header if we didn’t also make the snapshot_type_id part of the relation. Looks like PowerBI will introduce some limitations that I will have to accept. I have also made some performance improvements to reduce interval generation time from ~20 seconds to a few milliseconds. My performance test kit is a very weak, 2 core Celeron HP Microserver. 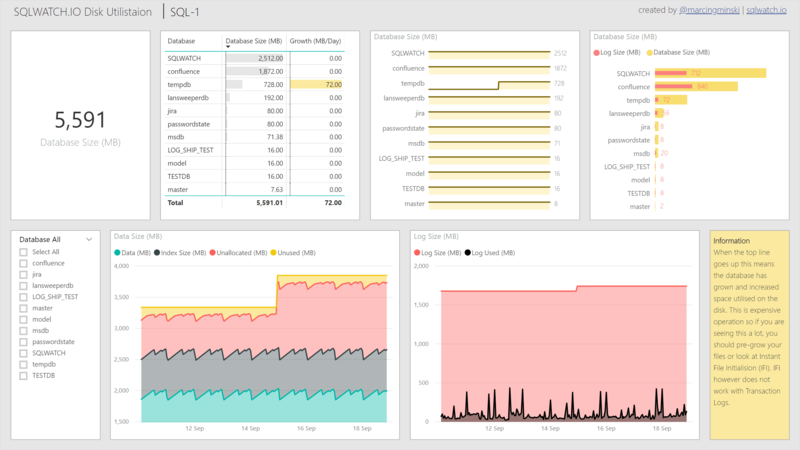 There is a chance that you did not notice it being slow on your SQL Server (unless you too run it on the Microserver) but if I make it run fast on my kit, it will likely run fast on your production box. Not a big impact on the overall performance but the real benefit is achieved when we restrict the number of IO operations. There is no point returning data just to later remove it. Let’s remove it directly at the source and move the WHERE criteria into the function. Considering the time_interval view (now function) must be called for every query, this is a big performance improvement which translates to a much faster rendering of the PowerBI dashboard. I will be updating the PowerBI dashboard to use this new function soon. Before you start jumping and rewriting all views to functions – please don’t. This isn’t an answer to all performance problems. 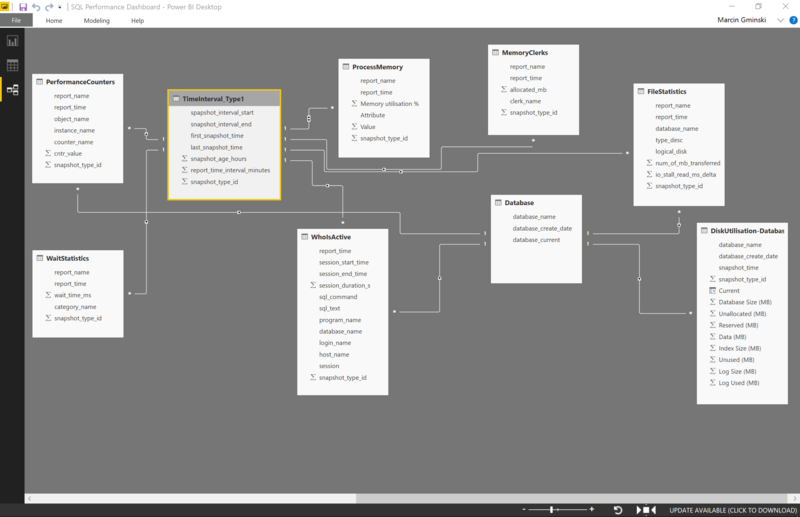 There have been reasons why the original view was slow to start with, driven by some functional requirements – such as having to return all intervals in order to filter in PowerBI. 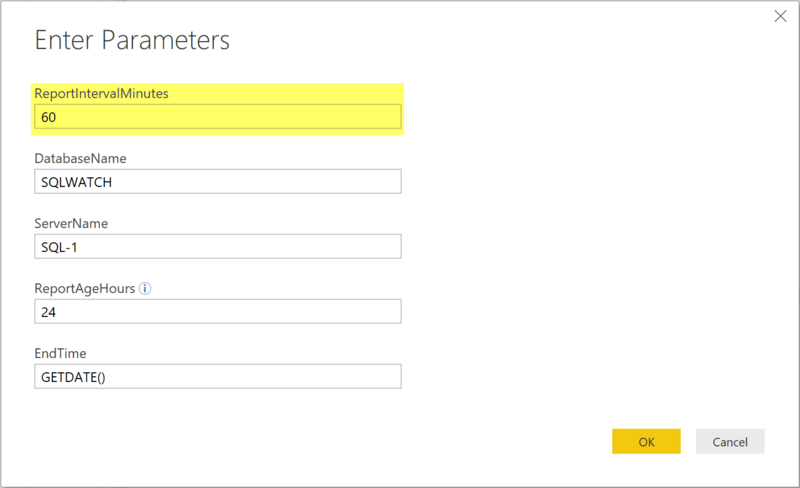 Currently, there are two interval periods available to select from in the PowerBI dashboard. 5 and 15 minutes. With the introduction of the new function above, it is no longer a requirement to have it hard-coded and therefore in the future, this will be a free text field rather than a drop-down. I have also started creating GitHub releases to make it easier to download historical versions – for example, previous PowerBI dashboards for people who are not always able to keep databases in sync with our release cycle.